FGC16064, FGC16081, FGC16096, FGC16105.1/2?, FGC16141, FGC16152. FGC16105 was excluded as recurrent or unreliable, but the other five seemed good. 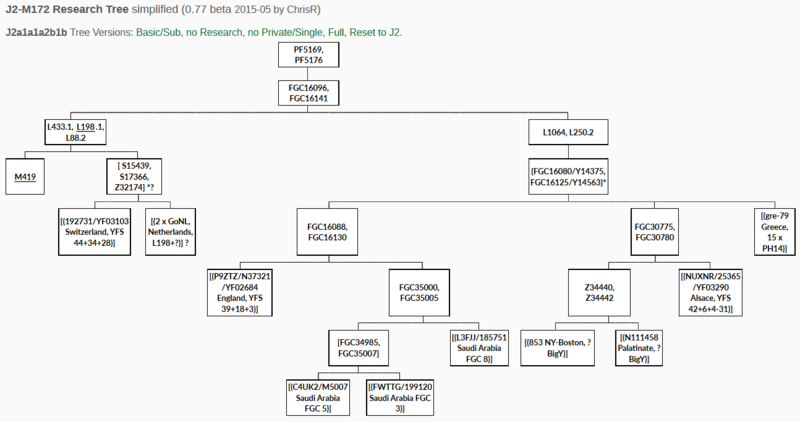 Fortunately in February/March 2015 we got four additional Y-sequences (one FGC Y-Elite, three FTDNA BigY) including one J2a-L198,L433 result (192731 Schrack, son of 9856). That allowed to certify the following SNPs as shared with L1064: FGC16096, FGC16141, FGC16152. FGC16064/Y14370 is still under investigation as maybe in a bad region or uncovered by BigY currently. FGC16081 is classified as unreliable. 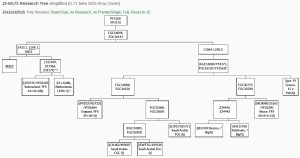 See FGC16096 Research Tree simplified. What is most interesting from the analysis of the results is the phylogeny, meaning the reconstruction of the paternal pedigree based on Y-SNPs which for splits based on 2 or more SNPs is very confident and solid. The comparison with Y-STR marker distance predictions clearly shows the great range of error using the up- and down mutating values. When using YFull YTree age estimates FGC16096 is ca. 11,665 years old and the split between P9ZTZ/N37321 Taylor (incl. the Wael kits) and NUXNR/25365 Gattie 5,300 years ago. That is substantially more then Y-STR distance estimations calculate. Using a calibrated mutation-rate excluding 9 fast mutating markers I had to set the Y-Utility Probability to 99% and the years/generation to 36 to have a distance of the Gattie/Gatter cluster to N37321 Taylor of approx. 4,600 years. But the distance to Schrack/Schrag can’t be also approximated good enough: it was only ca. 7,450 years and the distance to other clusters in L198,L433 is more around 5,400 years. So it seems from Y-STRs with the used methodology it is near to impossible to predict anything very useful regarding the phylogeny over a distance of more then 3,000 years. If we look at the clear Gattie/Gatter cluster with the used “ancient” Y-STR presetting we get distances from 1,100 to 2,100 years. The latter seems an overestimation. 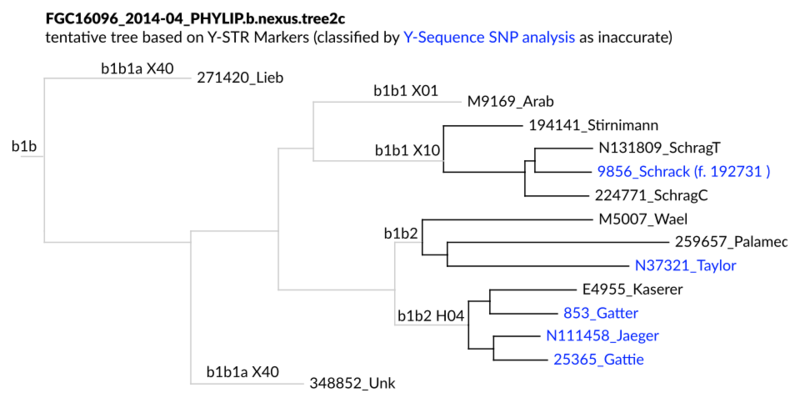 If we compare to the Y-SNP phylogeny there is one surprise: while by Y-STR28 (fast mutating markers excluded) N111458 Jaeger seems nearer to 25365 Gattie (1,110 years) the Y-SNP analysis clearly shows N111458 Jäger shares 6 SNPs with 853 Gatter which are negative in 25365 Gattie. So we have a inverted phylogeny for this three kits. N111458 Jäger has genealogy origins 1729 in Leimen, Südwestpfalz (SW Palatinate) and from Peer Gatter’s research the 853 Gatter (New York/Boston) lineage could go back very well to one of the historical Gatter regions in Palatinate or as well Alsace. The genealogy origin of 25365 Gattie is 1700 Seltz, Alsace. So all of the cluster seems to have its origins in the Upper Rhine area. Interesting would be to find the reason why Gattie/Gatter share a similar surname, while a later descendant changed the surname to Jäger (hunter). Testing of as much members of different L433 and L1064 clusters as possible with BigY or better FGC Y-Elite resolution. 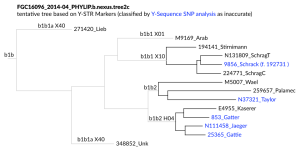 Validating 1-2 SNPs per haplogroup by sanger sequencing (YSEQ) and use them as primary haplogroup naming SNPs.